April 12, 2016 By W. T. Whitney Jr. They are expressing thanks for solidarity on their behalf and discussing what the Cuban Revolution means today in a crisis-filled world. 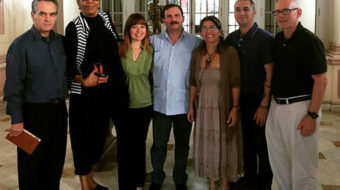 Former Cuban Five prisoner seeks friendship with U.S.
"Keep the solidarity movement going in the fight to lift the blockade. Please extend our deepest gratitude to all." 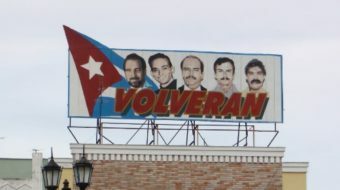 Organizations and activists who have been fighting for freedom for the Cuban Five will descend on Washington D.C. during the week starting Sept. 11, for a series of political actions. September 4, 2014 By W. T. Whitney Jr. 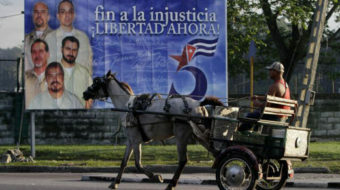 The Cuban Five, arrested by the FBI in Miami on September 12, 1998, were political prisoners; three still are. March 3, 2014 By W. T. Whitney Jr.
At the airport, Gonzalez' wife Rosa Aurora, mother Magali Llort, and two sisters were the first to greet him. Cuban Five prisoner Rene Gonzalez, in Cuba since 2013, was also there.